Ski, Ride & Play for Habitat Raises Nearly $11,000! FOR THE BENEFIT OF HABITAT FOR HUMANITY OF TUOLUMNE COUNTY! March 13, 2013 — PINECREST, Calif. — This past Saturday, March 8th, Dodge Ridge proudly hosted the annual Ski, Ride & Play for Habitat and the Taste of Tuolumne with over 150 participants enjoying a festive day featuring an all-mountain Vertical Feet Challenge on the slopes followed by great regional food and drink while raising nearly $11,000 for the benefit of Habitat for Humanity of Tuolumne County. Habitat for Humanity of Tuolumne County (HFHTC) is an affiliate of Habitat for Humanity International and is a nonprofit, ecumenical Christian ministry founded on the conviction that every man, woman, and child should have a decent, safe and affordable place to live in dignity and safety. The Ski, Ride & Play for Habitat and the Taste of Tuolumne are annual events at Dodge Ridge created as a way to give back to the community by hosting an action-packed day of fun and exciting events with all proceeds benefiting HFHTC. The day-long event started off with the Vertical Feet Challenge for all ages with skiers and riders competing either individually or as a team with a donation to HFHTC as the only requirement for event entry. For 3 hours thirty competitors tracked up the mountain earning points for each run taken as well as bonus points for completing other “challenges” such as knowing the skier and snowboarder Responsibility Code, wearing a helmet, wearing a silly hat or costume and even for giving a ski patroller a hug! After the three hours of competition that saw competitors zig-zagging all over the mountain, Team RonSki won the Vertical Feet Challenge barely edging out second place Team AnneSki while helping to raise over $4,100 for the benefit of HFHTC. Then in the afternoon, Dodge Ridge and HFHTC hosted the much anticipated Taste of Tuolumne event with unlimited, delicious food samples from Black Oak Casino, China House, Christopher’s Ristorante Italiano, Diestel Turkey, McCaffrey House, Mi Wuk Kettle Corn, The Rock of Twain Harte, The Steam Donkey, Zoe’s Coffee House, Pizza Factory, Nature’s Whole Food Depot and more with beer, wine and cider tastings provided by Miller/Coors, Barefoot Wine, Gallo Wine and Indigeny. Throughout the Taste of Tuolumne the crowd of hungry and thirsty revelers enjoyed live music performed by local favorite Uplands Drive as the sun settled in the west over the snow-covered slopes of Dodge Ridge. 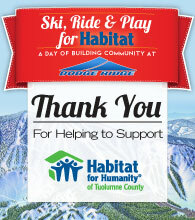 Habitat for Humanity of Tuolumne County and Dodge Ridge would like to thank all of the competitors, vendors, sponsors, volunteers and everyone else who helped to make this year’s Ski, Ride & Play for Habitat event such a success. This event has become an annual tradition at Dodge Ridge and will continue to support and develop Habitat’s mission in our communities for seasons to come. For more information on Habitat for Humanity of Tuolumne County or to make a donation, please call (209) 536-0970 or visit their web page at www.habitattuolumne.org.